Any well-drained Soil (Well-drained soil required and preferably rich in humus soil - so mulch with 2 inches of garden compost or grass mowings after planting, followed by mown leaves covering lawns each autumn. Remove mulch in March). Suitable under glass in an Alpine House in a pot. 2 attractive blue-grey wide leaves are held at ground level and last through flowering. Between the leaves, in May-June, appears a large, deep reddish 5 inch globe of flowers. These are borne virtually at ground level on a 6-8 inch stem; the effect is thus very striking. Native to Afghanistan and Tadjikistan and growing in dry mountains at high elevation. 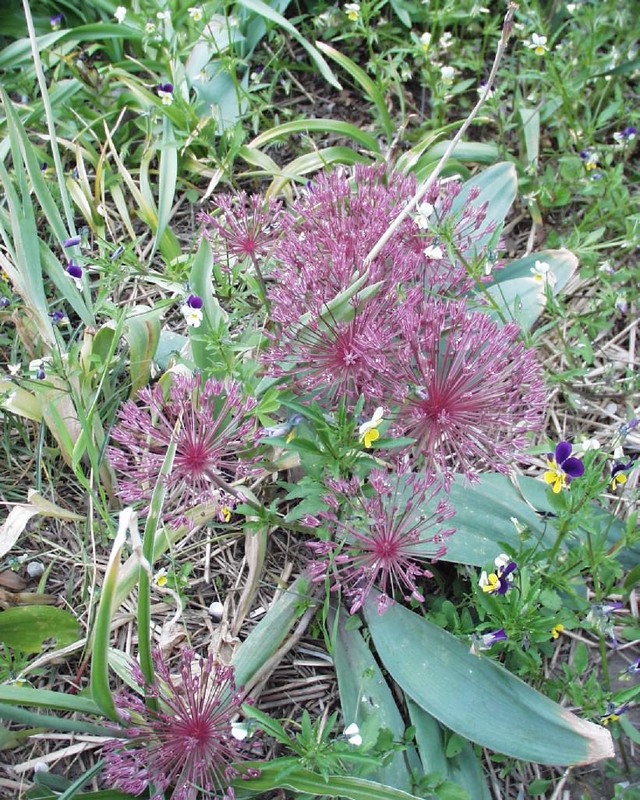 "Of the same group as Allium karataviense, this species has much longer leaves. Height 30cm." from R.V. Roger. "It has a wide umbel growing close to the ground between its two broad leaves. With dark pink, deep red or purplish flowers pointing in all directions and gaps in between, the umbel appears to be opening many arms wide in welcome. Bees, other pollinators and butterflies love the smell and taste of Allium Nevskianum, while rodents and deer tend to avoid it! Partners are Allium Purple Sensation, Allium sphaerocephalon, Allium gladiator, Allium Silver Spring and Allium Mount Everest." from Farmer Gracy - Keukenhof gardens is one of the world’s largest gardens dedicated to flowers, and certainly the only one to be devoted exclusively to bulbs. 32 hectares of garden graced with magnificent trees and a meandering stream light up with all the colours of the rainbow and more as over 7 million flowering bulbs vie with each other for attention each spring. Of course, we’d never give up our place at Keukenhof – and if we did, we’d struggle to get it back. The waiting list of hopefuls bide their time for 10 years or more before getting a chance to show off their growing skills and gorgeous blooms! "It makes an excellent, well behaved groundcover, with larger flowers and longer leaves than other members of this group. Well suited to our coastal climate of Canada, it prefers consistent moisture while in growth and tolerates summer drought." from Phoenix Perennials. Plant at 4 inches (10 cms) depth with an inch (2.5cms) of fine grit under them for drainage and 12 inch (30 cms) apart. Far Reaches Farm in USA - You have entered the Plant Nerd Zone where once a week (or so), we will do a posting of a plant from the Far Reaches collection that most likely is not yet available and in some cases, will never be. Our intention is not to tease or frustrate but to share with you some of the Plantae Obscura which makes strolling through the green maelstrom of our stock houses such a joy for all of us here at the nursery.